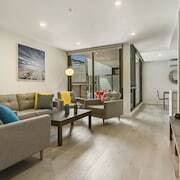 You'll find plenty of places to stay in South Melbourne with 43 accommodation options to select from, including 27 apartments. Visit top attractions in the surrounding region such as Melbourne Cricket Ground and St. Kilda Beach. Why should you consider an apartment over a traditional hotel room? Apartments are ideal for families who want the conveniences of home, and also for solo travellers who want to stay in a quieter area. Though weather is just one factor, it can impact your holiday, especially when planning a longer stay. And since apartments often have more rigid cancellation policies, it's good to understand these weather averages before booking. 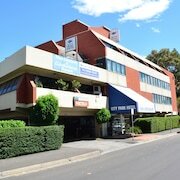 South Melbourne is a walkable area to enjoy your holiday. Explore the area and cultural attractions such as National Gallery of Victoria, or visit one of the family-friendly sights such as SEA LIFE Melbourne. You’ll find favourite places to visit like Melbourne Cricket Ground and St. Kilda Beach in the larger area. Fly into Melbourne, VIC (MEB-Essendon), which is located 8.1 mi (13 km) away. Otherwise, look for flights into Melbourne, VIC (MEL-Tullamarine), which is 12.8 mi (20.7 km) away. If you'd like to venture out around the area, consider renting a car to take in more sights.